So, what does a person do when she loses her job and it's the middle of summer? Head to a massive lake on the border of Arizona and Utah, of course. And that's where I've been these last few days. Imagine getting to the most middle of nowhere place you can think of (actually they filmed parts of the original Planet of the Apes here) and then stumbling onto one of the largest bodies of water you've ever seen. 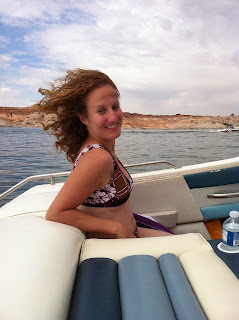 Lake Powell has more shoreline than the west coast of the United States. Mountain Guy spent time here as a young man, cooking up grub for tourists. "This is the restaurant where I worked," he pointed out on a driving tour. "And that is the dorm where I lived. And here is the ditch I fell into walking home from work, drunk, after dark." We also took a quick gander at the Glen Canyon Dam, which is how the lake came to be at all. We were gonna take the elevator down to walk across, but we had to wait for the tour. "I don't need a dam tour," I said, in honor of Chevy Chase. "Now, where are the dam bathrooms." Wife: "John, you crazy fool! You don't have a right arm anymore; don't you think it's time to retire?" John: "I think I'll explore the uncharted territory of the greatest canyon in the world." On the 4th of July, we went out on the lake. Our fearless skipper, Bobby, knew just where to go. A couple hours in, we found ourselves in a quiet cove with shear rock face rising above us. The girls jumped in like little sea horses, paddling around on styrofoam noodles, squealing delightedly every time the wake of a passing boat rolled in. Bobby stuck his beer in the sand and took a cat nap on the beach. Mountain Guy and I whispered sweet nothings in each others' ears...actually, I felt like vomiting, so I laid down on the bed he made for me on the boat. On our way back, the girls sat on the bow, and Mountain Guy and I watched from the back as they popped up like corn with each pounding wave. Back at the house, Grandpa John cooked a turkey, and we watched fireworks from the front porch. Then, with smiles and sore butts, we went to bed. May you find yourself in vacation land soon.